What is your most memorable moment with the orchestra? I will always remember the last MCO concert with Claudio Abbado that I could attend on April 14, 2013 in Paris, Salle Pleyel, in which he performed together with Martha Argerich. It was a feast of sounds, and it ended with a never-ending rapturous applause for Claudio, Martha and the MCO. People were standing on their chairs shouting and crying like the kids in a rock concert! What makes a “perfect” concert? When all the musicians are in good shape and full concentration, with a conductor they like and respect. When and where did you first experience the MCO in concert? I think it was in August 2010 in Stockholm where they played Händel's "Elias" with Daniel Harding. It was an impressing concert, and there also was a charming session with some members of the MCO playing in a private house the night before. Why do you support the MCO? I am neither a musician nor an expert in classical music. But I love to listen to this world-class orchestra. It’s not only the excellence they prove in every concert but also the joy they show in playing together which you can see and feel in all their concerts. And it’s the special culture and structure of the MCO that I admire. They are real entrepreneurs, each of them, because they have to earn their budget every year on their own without great help from public authorities. What do you like most about the MCO? The people. Born on February 8, 1943. Attended school in Olpe in Westphalia until 1962, afterwards studying law in Freiburg, Muenchen, Muenster. Passed his first state exam in 1966 (“Referendar”), and the second state exam in 1970 (“Assessor”), getting a doctor’s degree in law in 1968. Started to work as a lawyer in 1971 in the Duesseldorf office of the law firm Hengeler Mueller, becoming partner in 1975, and still working there ever since. Majoring in Corporate Law, especially law of corporations and groups of companies, advising listed companies as well as family-owned companies. Member of several supervisory and advisory boards. Since 1999 lecturing at the University of Bonn, honorary professor since 2002. 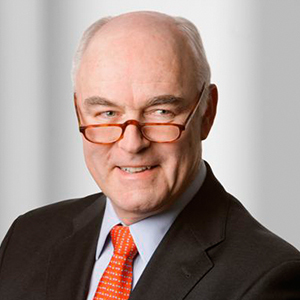 Chairman of the Committee on Corporate Law of the German Lawyers’ Association since 1994.